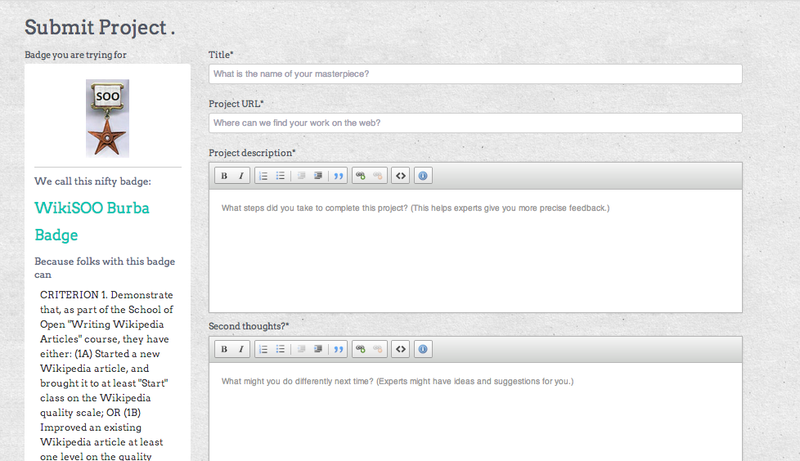 Your Task: read "Fast Facts" and "What it Looks Like in Action" and post your ideas for Badges for your course below. 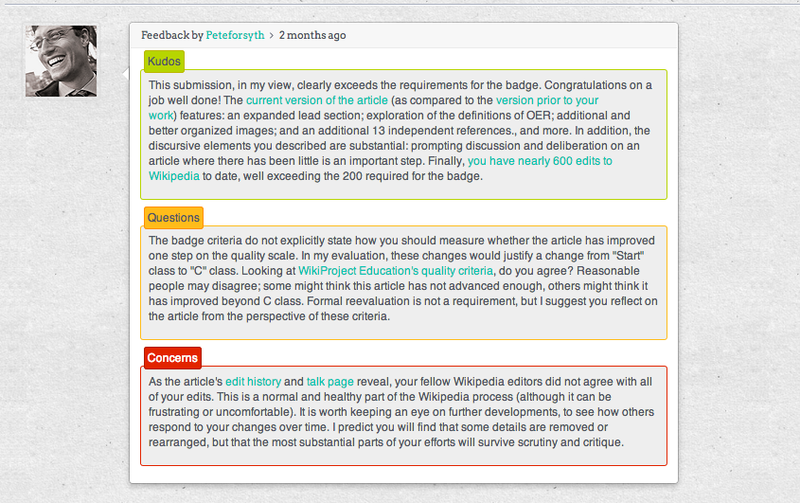 At P2PU, Badges are a way for learners to get feedback on their learning projects. A "learning project" is what learners produce in your course--it can be a book report, an Arduino project, a presentation or a poem. As a course organizer, you can insert you Badge into your course wherever it's appropriate. 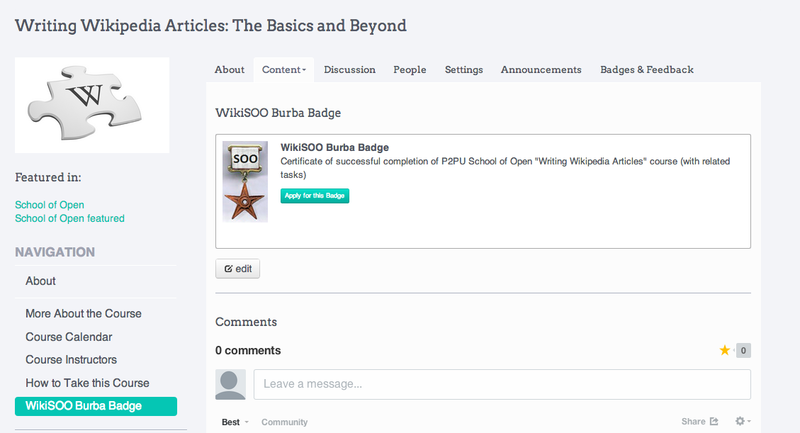 You can create your Badge at badges.p2pu.org and integrate it into your P2PU course on the "Badges and Feedback" tab. An Expert is someone who either a.) created the Badge or b.) has earned it. Only Experts can award the Badge to someone else. That said, any learner can give feedback to any other learner. 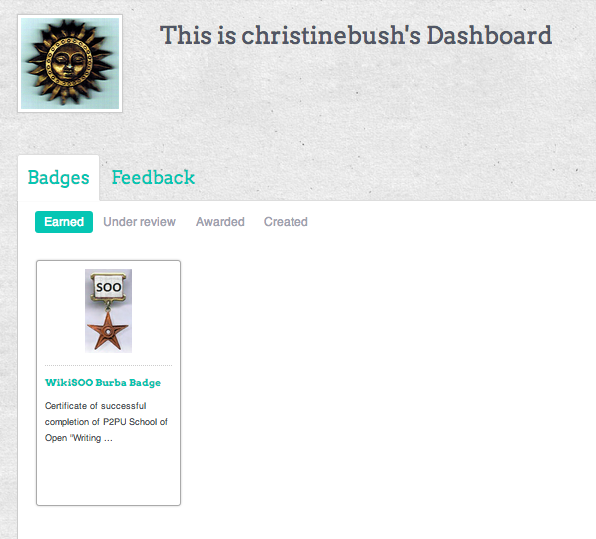 You can share you Badge via Twitter or embed it on any web site via iframe. Our Badges do integrate with the Mozilla Open Badges Infrastructure. Christine is enrolled in the Writing Wikipedia Articles course on P2PU.org. Her learning project is to start a Wikipedia article, improve another Wikipedia article demonstrably, and make more than 200 edits to Wikipedia. 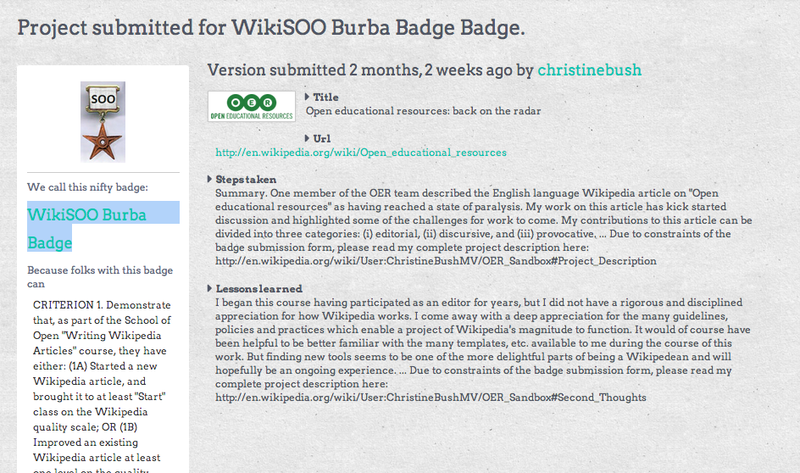 In her course, she clicks on the "WikiSOO Burba Badge" in the left column and applies for the Badge. When she submits her project, she is prompted to walk through the steps she took to accomplish the task, and to reflect a bit about what she would do differently next time. She clicks "Submit Project." Peter, an Expert at the SOO Burba Badge (meaning he created it or he has been awarded it already) gets a notification that a project has been submitted and looks over Christina's project. He then gives her qualitative feedback to improve her project in terms of "Kudos" "Questions" and "Concerns." Since she has met the requirements to get the Badge, Christina is notified via email that she is now an Expert. The Badge now appears in her profile, and she can award the Badge to others. She can also push the Badge to her Mozilla Open Badges Backpack. Huzzah!